The Chad Morris era of SMU football got off to an interesting start on Friday night at Ford Stadium. The Mustangs lost to No. 4 Baylor 56-21 but showed some positive strides from last season. The game got off to an unusually fast start. Baylor struck first on their first possession with a four-play 75 yard drive capped off by a Shock Linwood touchdown run. SMU followed that up with a 46 yard touchdown pass to Courtland Sutton on their first play from scrimmage. Baylor quarterback Seth Russell ran for a touchdown 58 seconds later, making it 14-7 just two minutes into the game. SMU responded with an 81 yard drive that ended in a touchdown run by Xavier Jones, tying the game at 14. Baylor answered with a touchdown catch by Jay Lee on a 75 yard drive of their own. 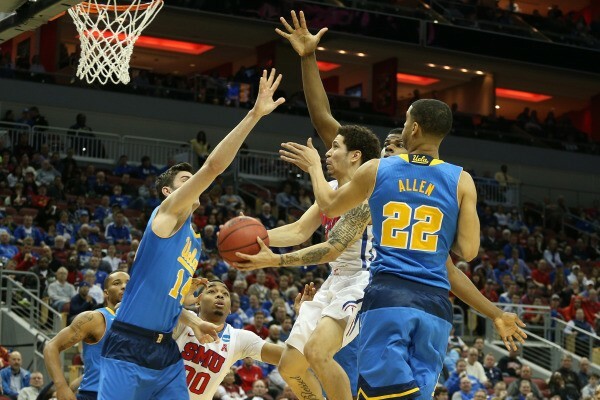 SMU was forced to punt on their next possession and Baylor took advantage. Seth Russell hit KD Cannon for a 36 yard touchdown, making it 28-14 at the end of the first quarter. Mustang quarterback Matt Davis found Courtland Sutton on a 36 yard touchdown pass to begin the second quarter. From there, the SMU defense settled in and came up with a huge interception with 1:13 left in the half. The offense managed to get to the Baylor three yard line before Matt Davis was sacked and the clock ran out to end the half. That missed opportunity was a game-changer for the Mustangs. They failed to score for the rest of the game. Meanwhile, Baylor poured it on. Seth Russell found Jay Lee for two more touchdowns in the third, making Lee the seventh player in Baylor history to have three touchdown receptions in one game. Corey Coleman and Chris Platt added two more touchdowns in the fourth. Baylor’s receivers combined for 423 yards and six touchdown receptions. Quarterback Seth Russell was 15 for 30 for 376 yards and 5 touchdowns to go along with his 59 yards rushing that included another touchdown. The Bears racked up more than 700 yards of total offense, setting a school record with 10.48 yards per play. SMU’s offense totaled 369 yards, a drastic improvement over last year’s 67. Quarterback Matt Davis looked sharp, completing his first 13 passes of the game. He was 16 for 23 with 166 yards passing, two touchdowns, and 115 yards rushing. Courtland Sutton emerged as a valuable deep threat, catching three passes that included two touchdowns. Despite the score, the Mustangs showed the fans that they are not the same team as last year. They looked much more competitive but could not keep up with Baylor’s speed and talent. The first half, in which SMU scored more points than they did in the entire month of September last season, had all 32,047 fans on the edge of their seats. Chad Morris’ team was outmatched but they showed just how far they have come. The Mustangs will take on the University of North Texas Mean Green next Saturday at Ford Stadium.